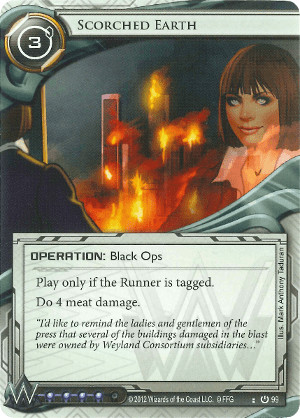 "I'd like to remind the ladies and gentlemen of the press that several of the buildings damaged in the blast were owned by Weyland Consortium subsidiaries…"
This card is insane. 4 meat damage for a tag and 3 is amazingly good. If you're building a deck and that deck includes a good number of tagging options, you need to consider 2 of this card. That's 8 influence outside of the Weyland faction, but what's 8 influence when you can win the game out of nowhere? 6-0 down on agenda points? Flatline victory cares not. This card is so good, all runners everywhere must respect its existence. Even if you decide to not include it in your deck, the mere fact that this card exists should be a worry for any runner who dares end their turn with a tag. This means woe betide a runner running on their last . Maybe the runner needs to keep 2-4 credits on hand just to get rid of tags in their last 1-2 , making their economy even more tight. Maybe you bait a taxing run then play a SEA Source on your first , having the cash to easily have the trace be successful, then play two of this on s two and three to win. Maybe you score a Breaking News for two free, mostly unavoidable tags, then Scorch. There's dozens of cards that can tag, many, many more cards that can tag compared to what the runner can do to prevent it, so the options here are limitless. Even if you don't win outright with it, trashing 4 of the runner's cards is still a great boon. Look, just look at all the deks on NetrunnerDB that include it: netrunnerdb.com. You'll notice it's less common in Jinteki decks though, which is because the J-dog has got its own options for things like this (looking at you Ronin). Plascrete Carapace was put in the very first Netrunner data pack as a neutral card specifically to give wide access to a hard counter, something that Crash Space was only partially capable of (especially being a resource itself, and thus trashable by the corp if tagged). Paper Tripping also exists for a modest 2 influence if you're fortunate enough to start a new turn with tags, but it's pricey at 4 and more situational than Plascrete. There's also I've Had Worse which, and I'm prepared to be proved wrong on this, doesn't actually fire if you take more damage than your hand size. You lose before the effect triggers. So if you've got 5 cards in your hand and the first Scorch doesn't hit it, you're still gonna lose to the second one. But that's pretty unlikely, and it also lets you draw 3 cards for 1 and it's 2 influence out of faction, so it's still a mostly great card to splash if your meta is still Scorched Earth centric.